In this day and age, it’s critical to have a solid wireless connection in and around your home. Whether you have a dead spot in a corner of your house, your basement, your garage, or somewhere in your backyard, you should be able to have a solid WiFi signal anywhere near your primary connection and router. One of the main problems many people experience with their wireless internet is sporadic slowness or connection loss. This can happen for a number of reasons. 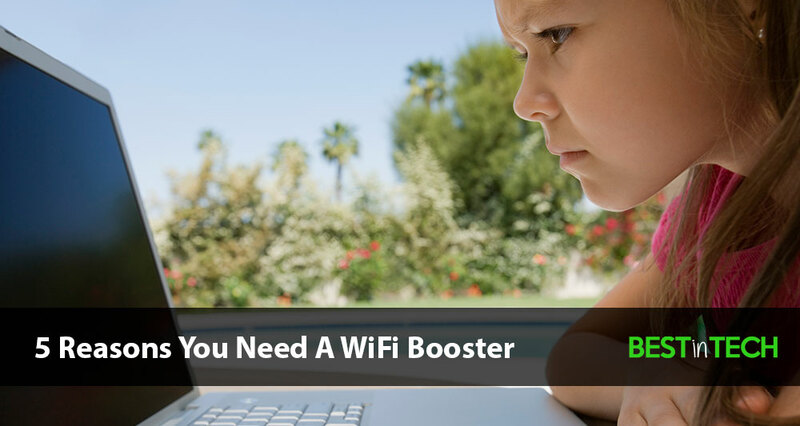 A common and extremely effective method for improving your signal would be to use a WiFi booster. These small gadgets are often inexpensive, yet highly effective at creating a strong, solid signal for you anywhere in and around your home. Wondering if you should get a wireless extender? Take a quick look at these 5 reasons why you would want to improve your wireless connection. If you have a bedroom, corner room, or other area that is usually spaced further from your router, you may experience poor or no wireless signal. These areas are often referred to as “dead spots” or “dead zones” and can be extremely frustrating to deal with. In most cases, these spots are too far from your router. However, because of how wireless signal is distributed, there may be other reasons causing this dead zone in your home. For instance, thick walls, other electronics, and other elements within your home can all impact the strength and distance of your wireless signal. In these cases, it often makes sense to use a wireless booster to improve coverage and eliminate areas in your home without signal. Much like the first reason, poor signal can also cause a slow connection. In cases like this, you will often keep your connection, but it will be extremely slow and sometimes unusable for streaming or other data-heavy applications. A slow connection is often a huge flag for someone to start using a wireless extender. Your connection speed is usually a metric of your ISP (Internet Service Provider) plan, your modem, and your router. However, being able to maximize the speed you have from those 3 elements can be influenced with a WiFi booster or extender. Many of the new versions of booster and extenders allow you to upgrade to the latest and greatest WiFi technology, even up to 802.11ac speeds. Plus, you don’t need to replace your modem, router, or upgrade your monthly Internet plan. Important Note: If your router is multiple years old and does not support the newest technologies, you are not likely currently experiencing the fastest connection possible. This is where the 802.11ac boosters shine. They bring the newest and fastest connection speeds to your network. You want to make sure you find a WiFi booster with features like dual-band WiFi and/or Multi-User MIMO for the greatest benefits. If you live in a larger home, chances are you should be using at least one WiFi booster. At the same time, even if your home is modest in size, it may have a layout where a WiFi booster can really help. Many ranch-style homes or homes with an elongated layout experience poor signal in certain rooms (depending on router positioning). Since concrete, walls, and wood can all impact wireless signal, many homes require at least one WiFi extender for best performance. Much like the layout of your home, your ability to have a strong wireless connection in your garage or yard will also depend on a variety of factors. However, if you are looking for great signal in your garage or in your yard, it makes sense to have your signal boosted. After all, you probably want to enjoy music or movies even if you’re on your porch, out in the backyard, sitting by the pool, or hanging out in the garage. By installing a wireless extender close to where you will be when you’re outside, you can experience a strong signal and enjoy your fast wireless connection throughout your property.